Editor’s Note: This is a special encore post. It attracted the fourth-most traffic in the first half of the year of any LinkedIn Sales Blog post that first appeared in 2018. Over the past 3 years, Sales Navigator has evolved from an extension of LinkedIn into a separate product and one of the industry’s fastest growing enterprise-grade SaaS applications. Today, more than 80% of the Forbes Cloud 100 use Sales Navigator to meet their revenue goals. In the early days of Sales Navigator, we chose to act like a startup and launch products as soon as they were ready, without much warning or pre-release training for our customers. We also acted independently, only integrating with a couple of systems, instead of opening up the platform to the dozens of types of sales applications a rep uses throughout their work week. Starting today, we will release Sales Navigator product updates on a quarterly cycle to provide advanced communications and training for administrators and users so they have adequate time to familiarize themselves with new features and take advantage of them properly. The recent launch of the Sales Navigator Application Platform (SNAP) marked a new era of Sales Navigator as an open platform. Our goal was to provide key Sales Navigator insights directly within the applications salespeople use daily, in categories like CRM, Marketing Automation, Business Intelligence, Sales Acceleration, Web Conferencing and eSignature. 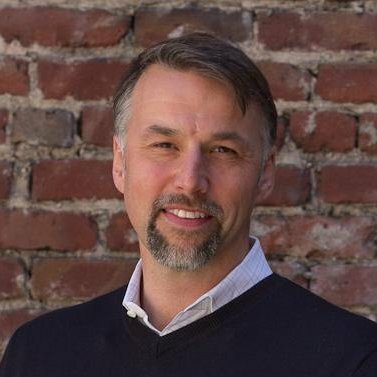 At launch, we announced our first wave of over two dozen partners, including Salesforce, Microsoft Dynamics and Marketo.Over half of those planned integrations are live, and we’re announcing four more who are joining the ranks and are available today: Demandbase, InsideSales.com, SugarCRM and Oracle Sales Cloud. Building your book of business can be a painful experience. Our redesigned account page experience streamlines the process of landing new accounts or building relationships within existing accounts, by giving you the information you need, when you need it. Now you can better understand whether the account is a good match, who you should be targeting, and how you can get a warm introduction. Company Summary: Determine if an account is relevant by getting insight into employee count, industry, revenue and contact information, making it faster and easier to identify the companies you want to do business with. You know your target -- you want to find companies in specific locations, industries, and/or sizes and people in specific functions and of sufficient seniority. Now, Sales Navigator will not only save those sales preferences to provide customized lead recommendations, it will also give you the opportunity to apply those as filters to any advanced search with a single click. You can easily hone or modify your searches to focus on the targeted people you care about most. 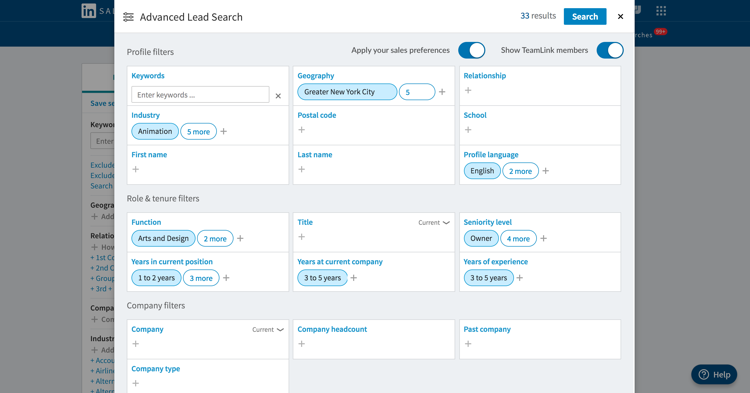 For instance, if you have saved sales preferences to locate Chicago-based Marketing VPs in Advertising companies with greater than 500 employees, and want to see who at the CXO level fits the same location, function, industry, and company size criteria, you can simply press the toggle in the advanced search box to apply your sales preferences, then swap in “CXO” for “VP” in that filter -- this makes it easy to find the right people for your next deal. For sales people, relevant and timely signals matter, and can make the difference between a missed opportunity and a closed won deal. You can now get email alerts when saved leads view your profile so you know when they show interest and may be more inclined to buy. 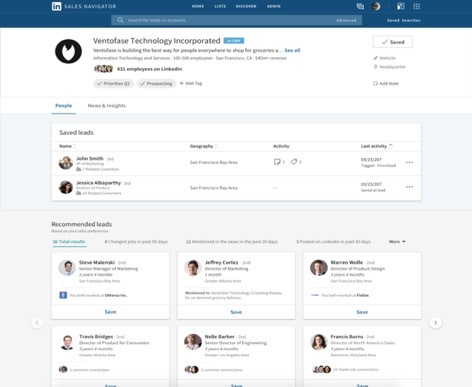 If you're a sales professional who just got hired at a company with its own Sales Navigator Team or Enterprise Edition corporate contract, we’ve made it easy for you to bring your Sales Navigator data with you without needing to contact LinkedIn customer support. To learn more about the updates in today’s announcement, visit our page here. We invite you to join our February 14th webinar, where LinkedIn Experts will give a detailed walkthrough of the latest Sales Navigator Q1 Release.